March | 2013 | Where in the World Are Our Kids? When I last left off, I was diagnosed with two immune problems: too many allergy antibodies, and not enough infection-fighting antibodies. We decided to address the allergy antibodies first and hold off on treating the infection-fighting antibodies. It was made clear by my nurse practitioner that my lack of infection-fighting antibodies is more correlated with stress than most people. The more stress, the fewer antibodies I produce. It is very important for my immune system to reduce stress as much as possible, and I would possibly be able to avoid having antibody infusions or injections. Stress reduction in order to live. No problem. Especially with two children adopted from Africa in the last year, and a husband who works four nights a week and all day Saturdays and Sundays, in addition to me working full-time. Still, it was manageable. Then my boss resigned. Not the one that was diagnosed with the brain tumor, the interim boss after that. He’s giving plenty of notice, and is definitely being helpful, but it’s become clear that I need to step up my responsibility at work in a very short period of time. There is no one else in place at this point that can do it. But I’m still pretty sick. Stress reduction in order to live. Now it’s a problem. So I went back to my allergist/immunologist physician and did nothing short of beg for IgG antibody replacement. It was really rather pitiful, actually. But in my perspective, I’m somewhat begging for my life and my job, which are both pretty important to me. I cannot stop my children from bringing home viruses and bacteria from school. I cannot quit my job. The only variable is giving a boost to my immune system. Now, in his defense, he has never seen me sick because I only see the NP when I’m sick because he’s booked months in advance. And in his mind, because I was about to get anti-IgE Xolair, he didn’t want to do two immune therapies at once. I kind of wanted to punch him in the face. With the love of the Lord. And maybe call down some fire and brimstone. And tear up the $600 bill he’s going to send me for that sound advice. And mail him the pieces. This week, I finally got my first injection of Xolair, which will reduce my ability to have an allergic reaction, although it takes several months to really see the benefits. It’s a two hour process to get the injection and then you have to see a medical provider afterwards, all the while having lots of vitals taken, peak flows measured, and a nurse giving you the stinky fish eye across the room because Xolair has a surprising side effect of causing anaphylaxis. I felt a little yucky and had some blood pressure issues, but I lived. So three hours after my Xolair injection, I met back up with the NP who has been seeing me. I blabbered on about all I’ve been through, and the changes in my responsibilities that have occurred since we last talked. She believes I should start IgG and wants to start the approval process. She has seen me really really sick. I have scared her on numerous occasions. After all, no one is more stubborn about asking for medical help than a medical provider themselves. She is going to talk to her supervising physician (my doctor) and see if she can get him to change his mind. Meanwhile, I start my third month of running a fever. I start my seventh month of having a productive cough. I wash my hands even more obsessively than before. I avoid crowded places with coughing people and perfume. And I wait, stuck in the middle between two medical providers and what they believe will make me well. I blame the spelling list. 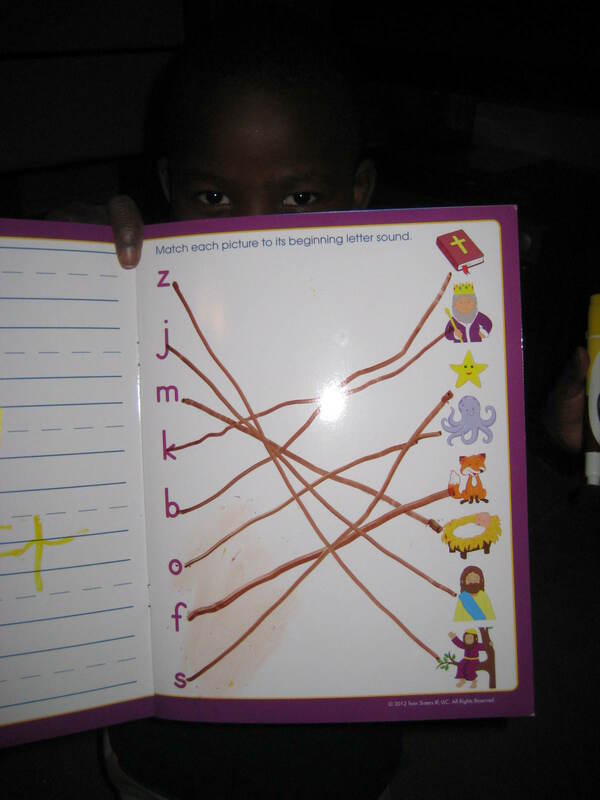 Rather than just having Palmer write out the words, we’ve tried encouraging him to think through how to spell words. We find that he is very good at thinking through sounds and spelling them. He’s actually much better at spelling than reading. Considering he didn’t even know what a letter was 7 months ago, we are more than pleased. Sometimes, we throw in similar words to his spelling words to see if he can use the same principles to spell new words. With words like art and farm, what was the next natural word selection? Sure enough, he spelled it perfectly. We all had a good laugh about that. I am so proud that my son can spell fart. Today, the issue of flatulence arose again (ahem, Addie), and we revisited the spelling. Sure enough, Palmer can still spell it. Then I remembered someone telling me about a funny book about a flatulent dog, and I had to find it. Tonight at bedtime, we introduced the kids to “Walter, the Farting Dog.” What could be more entertaining for a 6 and 8 year old? Palmer laughed so hard, I thought he was going to cry, choke, or pee. Maybe even all three at the same time. This is why I am thankful for my medical training. We finished the night with some juicy zerberts to the cheek, and again, the kids were in stitches. My friend, Angie, alerted me on Facebook that there is also a Walter the Farting Dog stuffed animal that makes real farting noises. Nothing says “Easter basket” like candy and a farting dog, don’t you think? Who knew flatulence could be so fun? The notice came on Friday: Palmer needs to bring 24 filled eggs to school for an Easter egg hunt this week. I supposed that this would probably be the best time to introduce the kids to American Easter. Of course, they already know about Jesus rising from the dead and the Biblical side of Easter, but it’s now time to cover the other side of Easter: the eggs, bunny, basket side of Easter. I asked the kids if they celebrated Easter in the Congo — when Jesus rose from the dead. Addie said yes. Palmer said no. This is a typical answer to “when you were in the Congo” questions. I could not send our kids into one of the most important kid-to-kid battles for candy and toys without sufficient preparation and practice. This is a definite early-bird-gets-the-worm skirmish. I had images in my brain of our children standing at an Easter egg hunt, baskets in hand, confused with other kids finding eggs, toys, candy before our kids having any idea what they are to do. This should not happen to our children. We have to make up for all the years of experience their competitors will have! 1. There are 25 eggs in the back yard. There will be zero eggs in the back yard before snack time. Hint hint. 2. Use the bag to your advantage to keep your hands free to pick up more eggs. 3. No pushing, shoving, or stealing of the eggs of siblings. 4. Do not follow another sibling. You will find more eggs if you use your own eyes and hands. 5. The goal is to find the most eggs. The kids had a great time. One child was distinctly more strategic and successful. The other sibling may have occasionally forgotten why she went outside. The outside hunt was followed by two in the living room, one in their bedroom, and another one outside. I then revealed that they were going to be hunting for eggs at school and at church with other children. They are so excited! It’s fun to introduce American traditions to kids who haven’t had the chance to experience them, and yet are old enough to understand and enjoy what’s going on. Just wait until they find out that there are treasures inside those eggs! I anticipate some serious squeals of joy. The kids have been trained and are ready. They know the rules. They have strategies. And if at the next Easter egg hunt, you see the Jewett children doing pre-hunt stretches, you’ll know why. Adoption of older children is always challenging. Adopting older children from another culture results in some frankly bizarre situations. Lately, our kids came home with a very exciting story about how at school, they were told to put their heads down and put their hands over their heads. “It was a tomato drill!” they exclaimed. Much of our children’s history is still a mystery to us. Stories are slowly coming, but the difference between truth and fiction is hard to discern, especially knowing their deep desire to protect their past. The clouded memories of childhood are fading quickly into a mixture of wishful thinking of how things should have been and denial of what really happened. What were they like as infants? Where did that scar come from? How can they come with the same history and have such different capabilities, nutritional status, and memories? What happened to them before they landed at the doorstep of an orphanage in Kinshasa? We will likely never really know. As we’ve been getting to know our kids from a completely different culture, I’ve appreciated that there are so many wonderful things that their culture has instilled in them. There’s always a fear of taking a child out of another culture that they will lose some important sense of self, the values of their culture, etc. But at the same time, leaving children in orphanages in third world countries just for the sake of “maintaining their culture” is hardly the answer either. There must be a careful balance of maintaining the best parts of their culture with the nurturing only a family can provide. 1. Their appreciation for “real” food. When given a choice between a french fry and fresh fruit, the kids will typically pick fresh fruit every time. They LOVE water and milk. They never leave the table without drinking every drop. Every grain of rice is cleaned off a plate. Meat– and especially fish–is a real treat. They didn’t really like candy very much when they came to America — they much preferred meat or bread. We didn’t offer them candy often, but they would refuse it more often than not. This is in stark contrast to what happens today in their new American lives. Almost every day, they come home with candy or candy-like treats. Do I take candy from my children? Heavens, yes! We didn’t even participate in Halloween, and we didn’t give them candy for Christmas or Valentine’s day, but we still have a never-ended supply of candy in a jar on our counter that we’ve confiscated from them. We find bags of candy stashed away in their toy drawers, in their backpacks, and stuffed around their car seats. They actually do like candy now, and I feel like the Candy Police trying to preserve their appreciation for real foods. It seems like Americans give candy to kids for every occasion, and especially as a reward for good behavior. We should not wonder why children are developing Type II diabetes. We started giving it to them when sugar replaced love and praise. 2. Their lack of dependence on technology. Our kids do not play video games. Out of a moment of desperation, Ken showed Palmer how to play Angry Birds shortly before Christmas, and it became immediately apparent that video games were not a good thing for our kids. The addictive and absorptive nature of technology was unhealthy and unnecessary. While there are some very good learning apps, I’m sure, I teach the first generation to be raised on technology-dependent education, and I can see the pitfalls. There have been some very interesting studies about how technology-dependent learners can learn more, but they think less. They can memorize lots of bits of information, but truly struggle when trying to put it all together. They have never had a college lecture without Powerpoint, so they have a hard time teaching themselves capture significant information, draw diagrams, pull information out of textbooks. But this is how real-life critical-thinking occurs. It’s not linear and spoon-fed. I want my kids to learn to read real books, have real conversations, play board games, make forts in the living room, ride bicycles, and play hide and seek. They have an amazing ability to entertain themselves without technology “stuff.” I like that their culture has given them imaginations and a strong desire for physical exercise every day. To introduce them to the “stuff” of the technological world seems contradictory to what we are trying to accomplish in establishing bonds as a family. They haven’t had technology before, so they do not have a sense of what they are missing. And I’m thankful for that. They will have plenty of time to gain computer skills. Wii controller skills are even further down on the list. 3. Their dependence on God to provide. This one probably scares me the most. Let’s be honest, in our culture, we don’t “need” God much. We know where our next 7 days worth of food are coming from. Even the homeless and jobless population in our city can get 3 free meals a day, 7 days a week. Contrast this to the culture where our kids come from where parents and children alternated days eating. That’s right. Not everyone could eat every day, so they switched off. Kids eat one day, parents eat the next. And not three meals a day. One meal every other day. This was NORMAL for the culture. Their homes were collections of refuse strapped together that would hopefully keep the rain out. Every drop of water was a gift. Clean water was a treasure. Running water, unimaginable. Shoes were worn until they disintegrated. They slept in the same clothes they played in. They shared a bed with 5 other children. They sang worship songs without a full band and coordinating Powerpoint with reflective backgrounds. We bought our kids some $2.95 shoes at Children’s Place a couple of weeks ago, and Palmer brought them home, looked in his closet and said, “Mommy, I have too many shoes.” So together, we chose shoes from his closet that he could give to children who don’t have any. Oh, how I always want him to remind me that we have more than enough. In our culture, I think we often have to create need for God because we have so much. Too much. I continually find myself asking: what am I doing that would be impossible to do without reliance upon God? I always want there to be an immediate answer. In America, during the season of Lent, we identify with our Lord’s suffering by giving up things like fast food, forks, and Facebook. Our children come from a culture where dependence on God doesn’t have to be so manufactured. 4. Their love for work. They love to spread mulch. Cleaning the bathroom? Better than watching cartoons. They bicker over who gets to vacuum. There is crying if one child gets to do a chore, but the other does not have a comparable one to do. Sometimes I run out of chores for them to do. I know that child labor is a real problem in the Congo, but that very strong work ethic is amazing. I’m very torn about this. They know the satisfaction of working until their muscles are sore and they collapse into sleep out of exhaustion rather than boredom. They are much better behaved when they are busily productive in the life of our family. And no, you may not borrow them to clean your house. At first, I wanted to undo much of what our kids had experienced: too much deprivation, too much work, not enough fun. But I’ve come to realize that they are in some ways very blessed to have had the experiences that they have had. They appreciate good food, because they know what it is like to be hungry. They like to work, because they have been too malnourished to have the energy. They know what it’s like to praise God out of poverty rather than excess. They value trust because they know how much it hurts when promises are broken. I worry that giving them the excesses of American culture will promote spiritual poverty. My children are living Beatitudes. They are beauty from ashes. They are resilient in ways that they shouldn’t have to be. They have brought just as much to our family as we have brought to theirs. And we are thankful for the culture they carry with them and how they teach us more about Him every day. Thank you, Lord, for bringing Third World Kids into our First World Family. Palmer did this matching game all by himself! 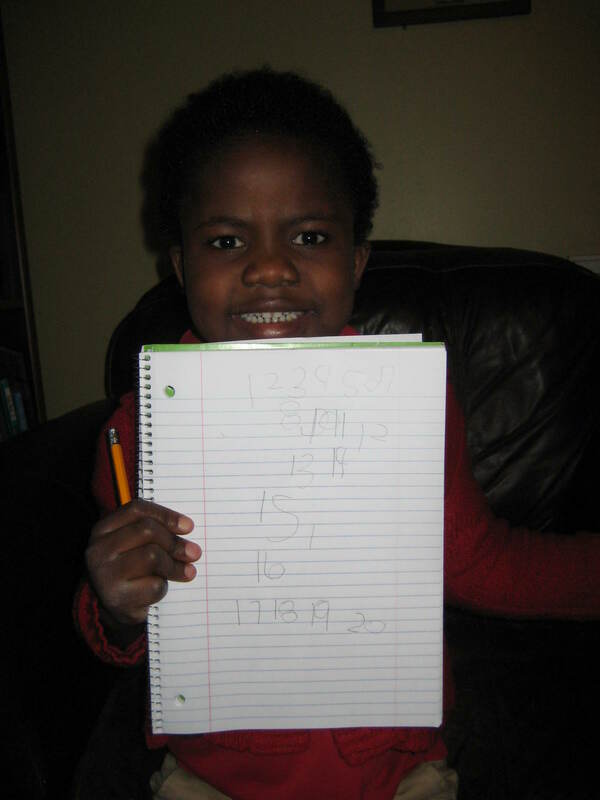 Addie practiced writing her numbers. She’s getting good!